Immediately to the east of Rose Grove shed and station was Gannow Junction in Burnley; the Copy Pit line took off in a south easterly direction, whilst the route to Colne (and originally Skipton) headed in a north easterly direction..
Class 25 25277 heads two loaded coal hoppers at Gannow Junction, taking the line to Colne as it heads for the coal depot at Burnley Central on 29 October 1982. The photo is taken from the BR replacement signal box. This is the simplified layout, with the single lead towards Colne, which was implemented as art of the Preston Power Signal Box scheme that was implemented in October 1973. The BR Gannow Junction illuminated diagram came up for auction in the GNR Auctions sale of 6 April 2019. I am grateful to Chris Littleworth who has provided the following notes. "It is from the later 1960s BR box, not the L&Y one. It has been heavily (and not very tidily – or prettily) amended, and now shows the layout just on the transition to Preston PSB in 1973, and will include the “stage work” (like the alteration to a single-lead junction) in preparation for that. The process for the LMR illuminated diagrams was different to the paper ones, as when an alteration was made, they altered the linen b&w master, ran off a new print and replaced the one in the box. In the case of the illuminated ones the master was sent to London where it was printed on to a stout plastic film, “coloured up” and then glued to a hard board; the holes were then drilled for the TC lamps etc. and the electrics installed before the diagram was fitted in the box. Because this process was much more time-consuming (and presumably expensive) they didn’t change the diagram every time an alteration was made; because it was printed on plastic film the detail could be relatively easily scratched off and altered in the box – a nice jolly for the draughtsmen who could therefore (like their earlier forebears) get out of the office for the duration! Very occasionally, you do, however, find a new plastic film glued on top of an earlier one, but that doesn’t seem to have happened here." 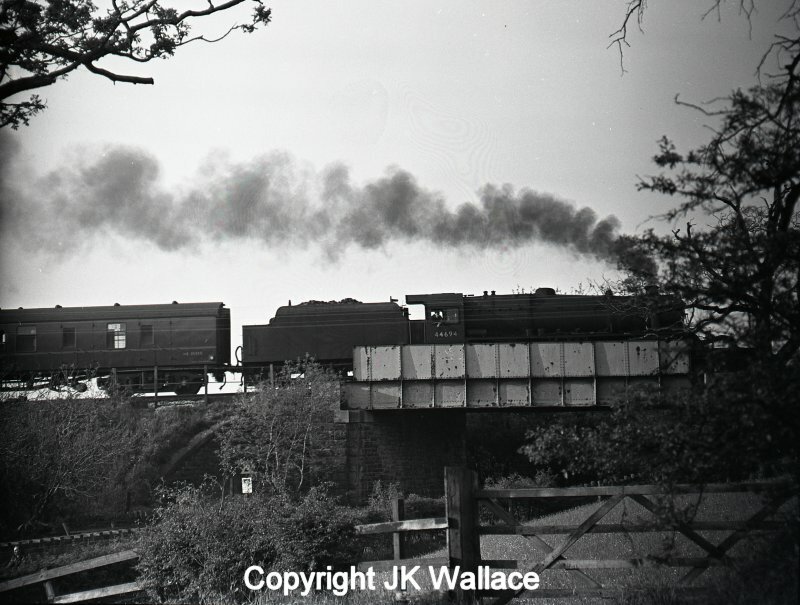 LMS (BR) Stanier Jubilee 45647 'Sturdee' hauling 1X37 Concrete North Ltd's return excursion Blackpool North – Leeds City leaving Gannow Junction (Burnley) after attaching banking loco at 21.00 hours in Saturday 4 June 1966. A study of modern Google photography suggests that this is the Accrington Road bridge, but confirmation would be welcomed. Photographer Arthur R Wilson, J K Wallace collection. 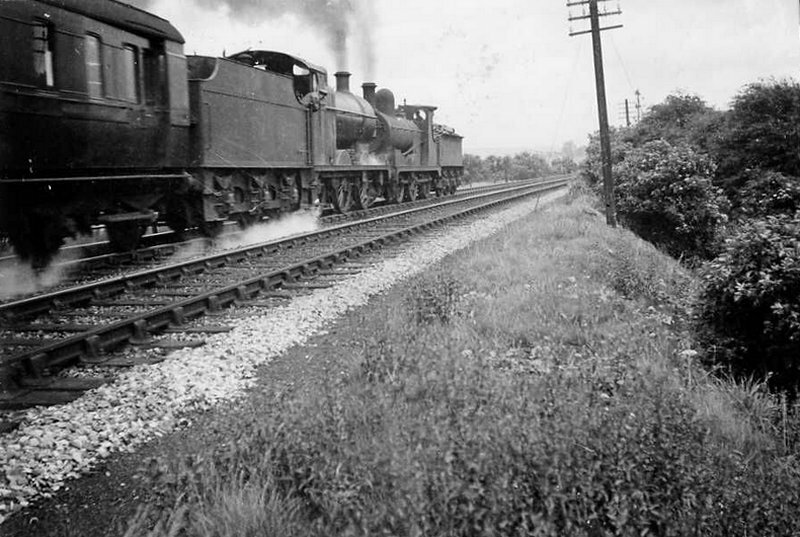 Midland 3F and Lanky 0-6-0s working a returning excursion from Blackpool to Yorkshire passing Towneley on the Copy Pit line c. 1937. Note home & distant signals to the right of the telegraph poles. A pair of class 37s - 37153 and 37202 - head the Preston Dock tanks on 3 July 1982 heading out of Towneley. 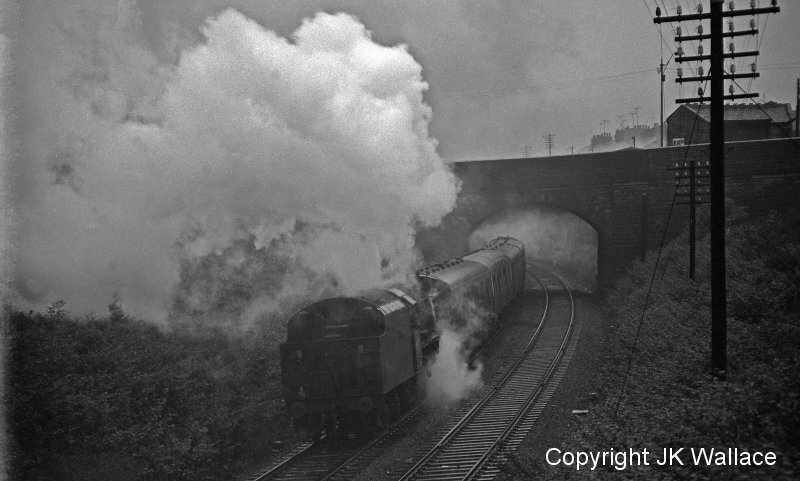 LMS (BR) Stanier Jubilee 45581 'Bihar & Orissa' climbing out of Burnley towards Copy Pit with 1X32 return advertised execursion Blackpool North – Leeds City at 19.21 Whit Monday 30 May 1966. It is crossing A646 road bridge. 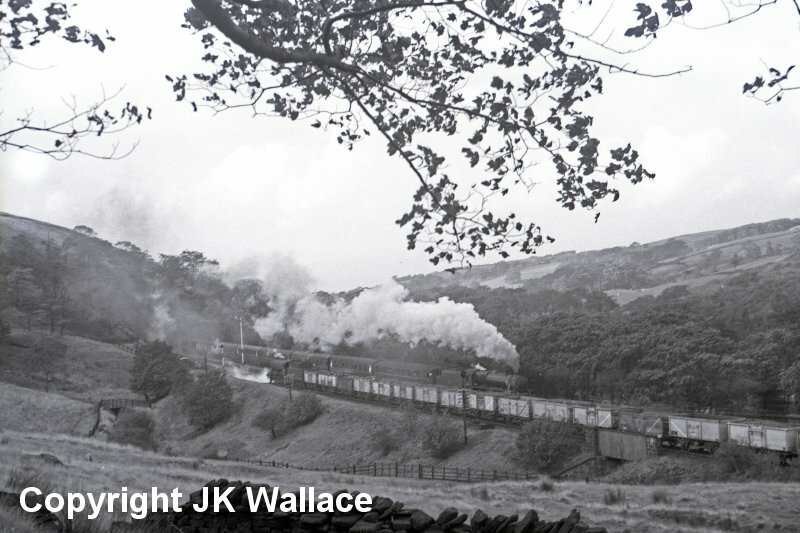 Stanier Black 5 44694 climbing out of Burnley to Copy Pit with 1X31 return advertised excursion Blackpool North – Bradford Exchange on Whit Monday at 19.10 30 May 1966. Excursion1X43 Bradford Summer Saturday return excursion Southport – Bradford Exchange with 45208 climbing out of Burnley 19.55 on Saturday 4 June 1966. 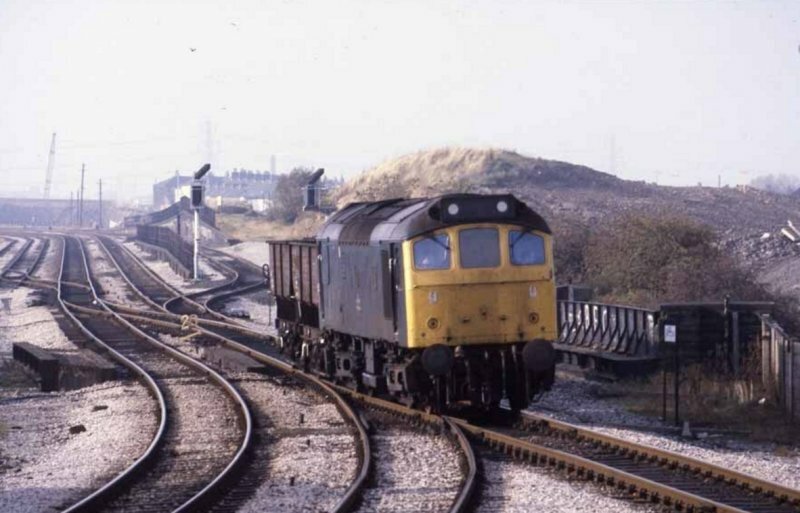 By this time the Preston-Southport line was closed, and therefore the most likely routing would have been via the Burscough Bridge - North curve, and so onto Preston. The girders of the A646 bridge can be seen to the left of the loco. Excursion 1X38 Ravensthorpe Central WMC return excursion Blackpool North – Dewsbury Well Rd climbing out of Burnley 20.05 on Saturday 4 June 1966. Where was - and when was - the pit at Copy Pit? The answer is that it was to the north of the line, and the site today can be located on Google Streetview (see panel on left). The view is facing Burnley on the A646 at Walton Copy Farm. The railway has breasted the summit and the two running lines can be seen to the left (south). 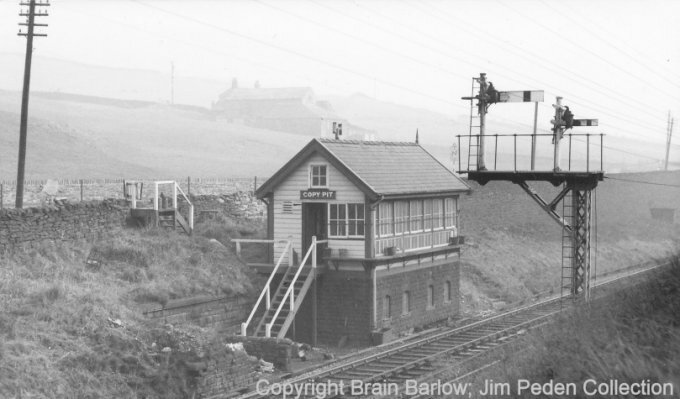 The signal box was a couple hundred yards in the opposite direction, and the flat ground over the wall was the site of two sidings that connected with the Todmorden-bound line, and trailed in towards Todmorden. The pit itself was to the north of the road, and was possible connected to the sidings either by a high-level tramway or overhead ropeway. It is clearly marked on the 1905 OS 1:2,500 map. The 1930 OS 1: 2,500 map shows the pit still in operation but now renamed Cliviger Colliery (Copy Pit). The mine appears to have been worked on a number of adjacent sites, the workings between the road and the railway tunnel being known as Royd Wood. In 1960 the pit is marked, but the sidings have been simplified. There appears to be two sidings terminating into a single lead directly onto the Todmorden (up) running line, and protected with a trap. The BR Copy Pit signal box diagram shows this arrangement, the point being directly opposite the access to the loop in the Burnley (down) direction. I'm grateful for Norman Sutcliffe pointing me to the National Mines Research Society site, which gives the closure date as March 1964. There was still a siding marked on the 1968 OS 1:10,000 scale map. In recent years the mine apparently broke into Holme Tunnel, and the line closed whilst the tunnel was strengthened. A map showing the various sites is on the Mine-Explorer site. 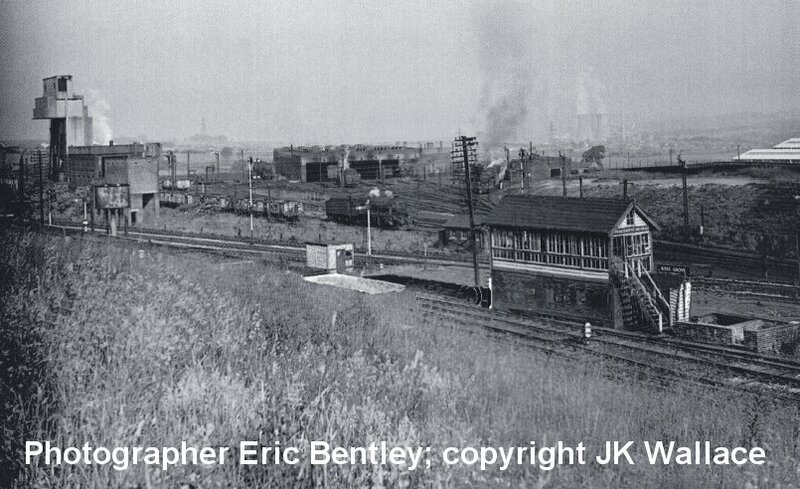 A WD 2-8-0 slogs towards Copy Pit from Burnley with 52 empty mineral wagons and a brake van. Stanier 8F 48466 bursts out of Holme Tunnel and arrives at Copy Pit with a Yorkshire bound haul of empty coal wagons. 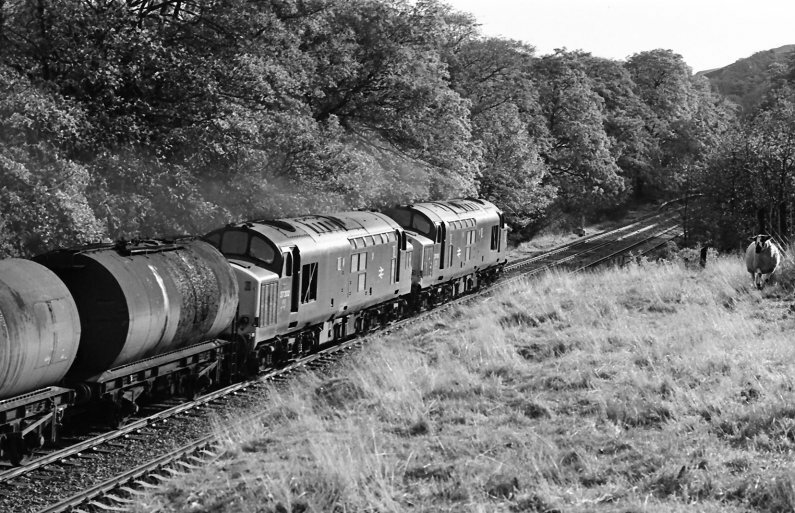 WD 90658 heads towards the entrance to Holme Tunnel and Rose Grove with a loaded coal train whilst the 13:30 Blackpool Central - Wakefield Kirkgate hauled by an unidentified Black 5 at 15:20 hrs on 30 September 1961. The journey down from Copy Pit to Stansfield Hall Junction, Todmorden continues here. Copy Pit signal box controlled the entrance to two loops, one in each direction, together with the sidings for the Cliviger Coal Company, yet all these features were some distance from the box, complete with intervening bridges. Only the cross-over was close to the box, and that was slightly to the north in the Burnley (down) direction.